Cross-posted to jokaydia.com I've been thinking about classroom design for a very long time but have never really been able to experiment with it until I found out about Second Life and the virtual building opportunities that it affords. When I first started working on my teachandlearn retreat on the island of jokaydia in Second Life, I realized that, for the first time in my career as an educator, I had an opportunity to create my ideal learning environment. I had the freedom to create any place I wanted. Strangely enough, what I created does not have desks or tables, it doesn't even have chairs. Instead, it has a hot-air balloon (great for small group conversations), a couple of Japanese tea houses, and a lot of cushions. Oh, and the view, you have to see the view! Building my retreat helped me reflect on my work and my philosophy as an educator. Deciding what to build and how to organize my space was a challenging process. Even before I started, I knew that I wanted this piece of land to facilitate learning and encourage interactions. Then, I had to ask myself what kind of architecture and layout would most accurately reflect my philosophy as an educator and be conducive to learning and meaningful interactions. So, as I engaged in building my retreat, I kept thinking about the relationship between a physical space and human interactions. As an educator, I had never had to think seriously about the relationship between physical space and learning. Teachers usually don't have to think about spaces for learning because they are provided for them. A teacher is always given a classroom, along with a course load and a group of students. A physical place in which to teach is just a given. In Second Life, however, I had an opportunity to create my own space. For the first time in my life as an educator, I had to sit down and think about the kind of space that I wanted to create as both a teacher and a learner. I had to think seriously about the relationship between meaningful interactions among people and the kind of place that best supports such interactions and learning that results from them. In other words, Second Life, by providing me with an opportunity to let my imagination run wild, to both teach and learn in my virtual retreat, has allowed me to question my assumptions about classroom design. It allowed me to experiment. It was through that experimentation that I have begun to explore the science of building spaces for learning. My experiences with building in Second Life, my interactions with both instructors and learners in this environment inspired me to start a small project designed to engage educators in thinking about, experimenting with, and designing spaces for learning. It is my great pleasure to announce that this entry marks the official launch of my Virtual Classroom Project in Second Life. Let me explain what the project involves. 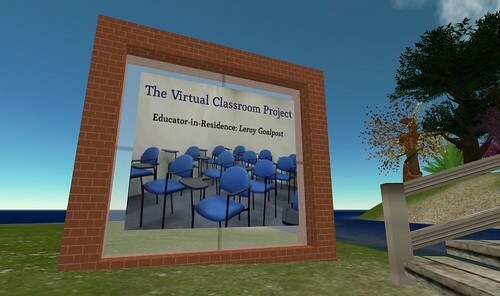 Over the next three months, I will invite individual educators to design and build their ideal learning space for use as either a virtual classroom in Second Life or as a prototype for a real-life classroom. These "Educators-in-Residence" will share their vision and expertise by creating their ideal classrooms on a parcel of land designated especially for this project. Each Educator-in-Residence will be given a period of one month and the necessary in-world support and resources to complete the project. As part of the project, each participant will document the process of planning and building through screenshots, guided tours, regular blog entries, and video capture. Once the project is completed, I will conduct an interview with the participant to highlight his or her work and bring it to the attention of a wider audience in the form of a podcast. Screenshots, blog entries, and video clips describing the project and its various stages of development will also be made available online in order to encourage discussions about classroom design both in real life and in a virtual environment such as Second Life. Each month-long residency will conclude with an in-world event to showcase the finished virtual classroom. Let me now introduce you to the project's first Educator-in-Residence, Leigh Blackall (SL: Leroy Goalpost). I am delighted that Leigh agreed to be the first participant. I am confident that his immense expertise in the field of instructional design and his passion for learning will be of immense value to this project. I cannot wait to see how Leigh will engage all of us in thinking about learning and classroom design. Leigh has agreed to document his ideas and his experiences as Educator-in-Residence by sharing blog entries, screenshots, screencasts, and even voice recordings on a wiki page that he has already created for this project. If you're interested in following his work and the evolution of this project, please take a moment to bookmark the SLurl to the project site on the island of jokaydia and drop by when you're in-world. You can also follow Leigh's reflections on his blog. The point of this project is not to merely observe as one educator designs and creates a learning environment. The purpose of this project is to start conversations about learning in online communities, virtual worlds, and everyday physical classrooms. I believe that the act of following one educator as he attempts to design his ideal learning space should not transform us into passive observers. Let's engage Leigh in discussions about teaching and learning or at the very least jot down questions to ask him once his project is finished. Let's remember that the space he is about to build will be his ideal classroom. It may not be your or my ideal space, but that doesn't mean that we cannot learn from Leigh and the creative process that he has agreed to share with us. Please contribute your thoughts and reflections by commenting on Leigh's work. Visit him inworld, leave a comment on his blog or his wiki, or respond to his ideas on your own blog. Take the time, in a week or two, to visit the project site. Take pictures. Ask questions. Above all, think about your own ideal learning space ... and if you're interested in being the next Educator-in-Residence, drop me a line. I am looking forward to this project and believe that it will be of particular interest to not only educators and educational technologists but also institutions interested in exploring learning space design, teacher preparation, and teacher professional development both in virtual worlds and in real life. I intend to record all my interactions with Leigh and reflect on his ideas and his work. I can't wait to see what he creates and I am sure that he will engage us in many valuable conversations about learning. Finally, I would like to thank jokay Wollongong for her support and for providing a virtual home for this project on the beautiful island of jokaydia in Second Life. This project would not be possible without her unfaltering encouragement and support. I've been very busy lately. First, I had to finish the complete draft of my thesis to be sent to the external reviewer before the defense. Then, I immediately turned my attention to EduCon 2.0. It's an important event for me for many reasons. First of all, it comes at a time when my research and thesis are finished and I can finally reflect on the whole experience which, as you can imagine, was about so much more than blogging. Yes, the thesis focuses on what happens when a group of grade eight students start researching and blogging while their teacher becomes a listener, a learner, and a contributor. But what I've learned from the research goes beyond blogging. My research taught me many important things about teacher professional development, classroom design, virtual environments, pedagogical shifts in the 21st century, and the nature of learning and instructional conversations. That's one reason why I'm looking forward to EduCon 2.0 - planning a presentation/conversation for those who are interested in attending my session gives me an amazing opportunity to reflect on what I have learned. But there are other, equally important reasons. EduCon provides an opportunity to meet many of the incredibly inspiring people whose work over the past few years contributed to my professional growth as an educator and a researcher. A couple of days ago, when I read carefully the list of all participants and presenters, I realized that going to EduCon will be like walking into my Google Reader, except that we'll finally be able to shake hands! I look forward to meeting some of my long-time virtual mentors: Will Richardson, Chris Lehmann, Christian Long, Patrick Higgins, David Warlick, and Joyce Valenza to name just a few. Their work has been instrumental in helping me with my doctoral research journey. Also, along with Sharon Peters and Mario Asselin, I will be part of a small Canadian contingent. Sharon and I met at a conference last year and have stayed in touch ever since. I know that this conference will give us yet another opportunity to chat about curriculum and professional development. I have never met Mario, however, but his work as Principal of Institut St-Joseph in Quebec City inspired me at the very beginning of my doctoral research to follow the example set by his school and use blogs or electronic portfolios to create a virtual extension of my classroom. When I first found out about his work through Stephen Downes' seminal article on blogging, I knew that my research had to revolve around eportfolios and blogs. It will be good to chat with him about blogs and the work he's been doing since. Finally, I'm looking forward to EduCon because it will take place inside a school, not at some posh convention centre. In other words, we will interact in the very spaces where learning takes place, in spaces where students interact on a daily basis. If our work revolves around classrooms, then talking about what we do shouldn't take place away from them unless absolutely necessary. Thanks, Chris, for bringing us together in an environment designed for interactions and learning, not just public speaking and passive reception. I mention interactions because the Science Leadership Academy has been designed with interactions - with meaningful interactions - in mind. That is one of the biggest reasons why I can't wait to see the school. According to DesignShare, the Science Learning Academy has been described as "one of the only examples of School 2.0 in the United States (and beyond)." It is a place where "the school's founder and the architects tried to make the renovated space [converted office building in an urban context] come to life to support a truly new way of embedding technology into the lives of their students/teachers." This is especially important to me because, when I first started teaching, I was given a classroom with no windows and a malfunctioning air conditioning unit. Needless to say, we ventured out of that classroom on a regular basis and, at the very beginning of my career, I found myself having classes in hallways, the courtyard, in the gym, and on the soccer field. At first, I looked at it as an unnecessary disruption, a nuisance, and envied teachers who had classrooms with windows and proper ventilation. But, as time went on, I began to realize that leaving the classroom was often the best thing to be done. These experiences led me to believe that the four confining walls can be very conducive to delivering lectures, but not always to meaningful interactions. Ever since, I've been very interested in classroom design and my interest in creating virtual environments for learning stems from my early teaching experiences outside of the classroom. So, when I first found out about EduCon, I knew that I had to be there to see this innovative learning space and to meet the principal who believes that "the design of a building [can] serve a particular pedagogy" and that "we can create schools where what we do with the information we can access is more important than the information we can memorize" (Lehmann, 2007). Because our school's core principles stress the collaborative and transparent nature embedded in "School 2.0" thinking, we moved the Principal's Office to the front of the office suite with a door leading straight into the main hall. Better yet, we wanted no "gate-keeper" guarding access to my office. From day one, the students and teachers would see my office as their office. Within the overall administrative suite, we made the offices smaller and created space for teachers and administrators and support staff to gather together. The office essentially was designed as community work-space and a dynamic teachers' lounge all in one (Lehmann, 2007). where students have a really wonderful, well-lit place to eat and hang out and for anyone walking down the sidewalk to see the lives of our students unfolding in real-time. And with that change came a change of name as well. We started calling it the café to attempt to signify the change in mindset the space represented. Every space - including what could have ‘just’ been a cafeteria - would be re-imagined as dynamic, collaborative, and public spaces that echoed what SLA and “School 2.0″ stand for (Lehmann, 2007). I am also really interested in seeing the school's presentation spaces, classrooms, and the hallway "streetscapes," all of which are designed as spaces where students can move around, engage in creative processes, and where explanation, instruction, as well as hands-on, and creative work can all co-exist. Needless to say, I can't wait to walk the halls of the Science Leadership Academy and interact with its staff and students.